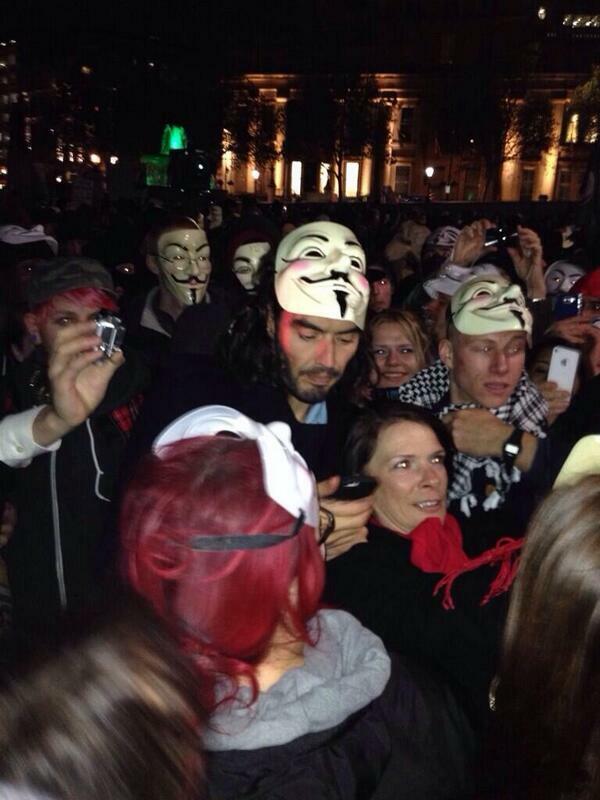 Protestors took to the streets of London on Bonfire Night as part of the worldwide Million Mask March. Last night in London, hundreds of protestors wearing the Guy Fawkes mask associated with the Anonymous movement took to Parliament and Buckingham Palace to protest austerity cuts, state surveillance, and corruption. During the Million Mask March, clashes between the protestors and the police took place, and there have reportedly been 11 arrests. A fire was also started by the Victoria Memorial, near the gates of Buckingham Palace. Russell Brand was spotted in the crowd, and Green Party MP Caroline Lucas had tweeted to say that she was also involved in the protest. 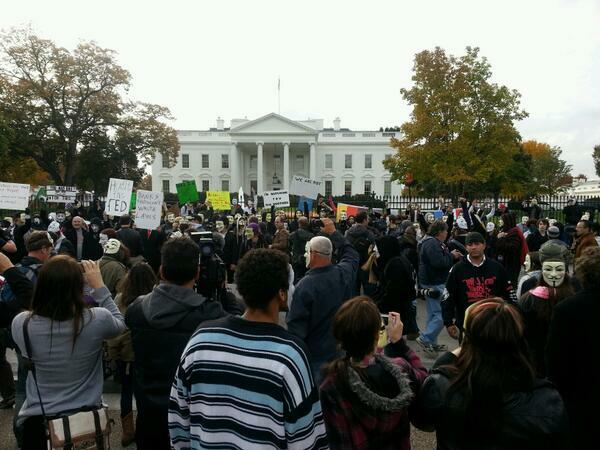 The protest was part of a worldwide Anonymous protest, with similar events taking place in New Zealand, Australia, and Japan, as well as cities such as Rio de Janerio, Dublin, and Warsaw. 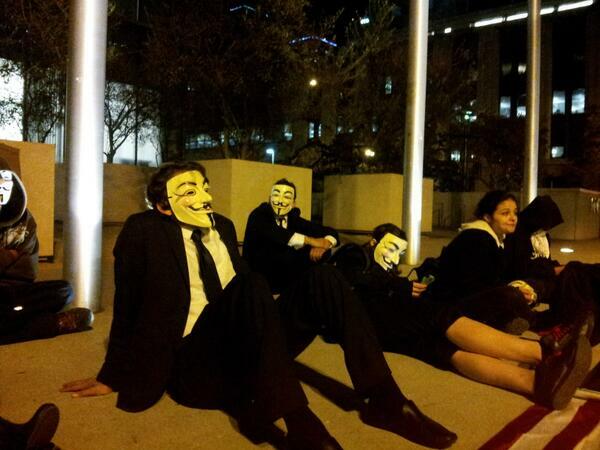 RT @PMbeers: They are staying all night at the LAPD Headquarters. Send Pizza and water. 400 cities, 150 countries. 0 media coverage. 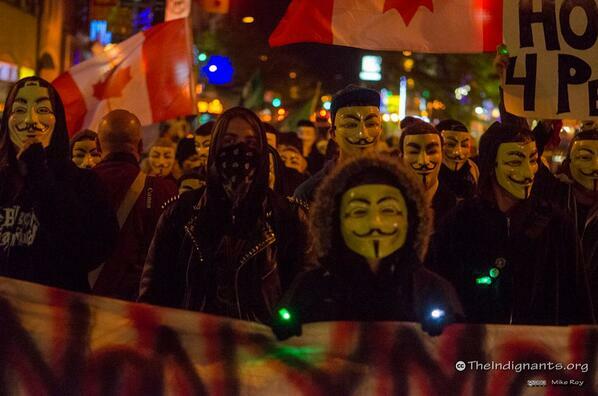 Currently streets of London are under heavy DDoS attack by Anonymous. Sold media is silence/down. Mainstream media doesn&#39;t post true revolutionary sht, NYT, Gaurdian ect were posting anonymous videos like a bat out of hell. Mainstream media doesn't post true revolutionary sht, NYT, Gaurdian ect were posting anonymous videos like a bat out of hell. 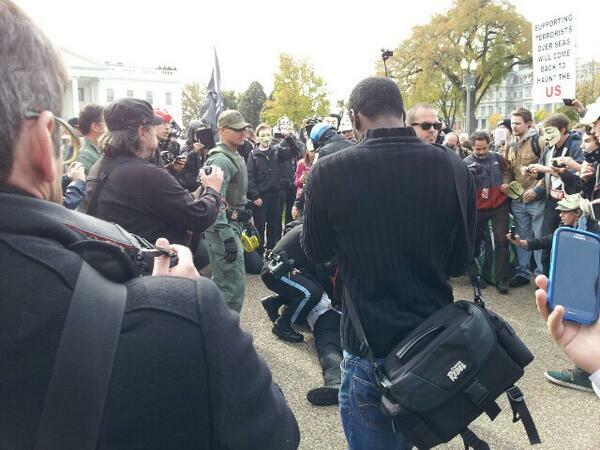 Any of the Big Ten Media outfits reporting on #Anonymous #MillionMaskMarch ? RT @OGPAKI: ANONYMOUS MEMBER ARRESTED FOR HANDING OUT MALWARE LEAFLETS. PLEASE RUN ANTI-MALWARE. "Remember who your enemies are: Billionaires who own banks and corporations who corrupt politicians who enslave the people in injustice."